Nar Phu Valley Trek is a lesser known, beautiful trail north of Annapurna. This region remains untouched by modern civilization and mass tourism. Often referred to as the ‘’hidden valley trek’, Nar and Phu valley offer a spiritual trekking experience with numerous villages of Tibetan heritage and undisturbed religious sites. People here herd yaks, trade with lower regions and harvest indigenous medicinal herbs for livelihood. Our 19-day-long Nar Phu Valley Trek starts with a sightseeing tour of some of Kathmandu’s UNESCO World Heritage Sites. Then, we drive to Jagat, a quintessential teahouse village in the Annapurna circuit. We follow the Annapurna circuit trek trail till Koto and branch off from there to Nar Phu Valley on a rugged, enthralling trail. We have set aside day 8 and day 10 for acclimatization which is crucial to adjust your body to high altitude. 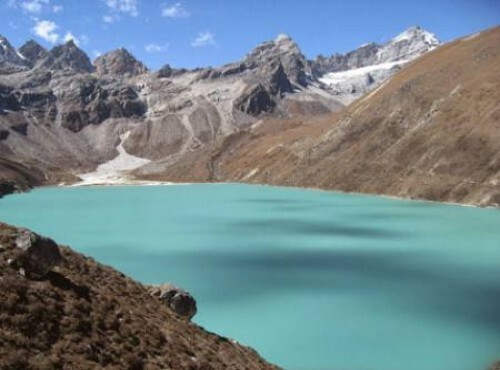 Apart from the valley of Nar and Phu, crossing Kang La Pass (5,315 m) is another major highlight of the trek. The pass rewards us with spectacular views of Annapurna II (7937m), Tilicho Peak (7134m) and Gangapurna (7455m). The Kang La pass connects Nar valley with Manang district and three other ethnic Bhotia villages of Neyshang valley. A huge stretch of high snow-peaks, grazing settlements, and ancient villages make Nar and Phu valley the gem of Annapurna. We gradually climb down from the Kang La pass to Thorong La pass and ultimately to Jomsom via lower Mustang. We fly from Jomsom to Pokhara and finally head back to Kathmandu the next day. Nar Phu Valley Trek is ideal for those who have a special interest in remote communities and their age-old ways of life. If you are looking for a short, easy and fun-filled trek in the Annapurna region, Adventure Club Trek also offers Annapurna Circuit Trek Short-14 Days and Annapurna Circuit Trek-21 Days. Trekking in the restricted Nar and Phu Valley in the Manag District and numerous villages with authentic Tibetan culture. Visit ancient monasteries including Tashi Lakhang Monastery, one of world’s 108 great Buddhist monasteries. It is a long drive to Jagat, so we start early in the morning. After breakfast we board a bus to Besisahar. The countryside sceneries rich with lush green forest, rivers and mountain vistas is quite pleasant. Upon reaching Besisahar we board another vehicle which will take us to Jagat. It is a bumpy ride on the dusty, rough roads. Overnight in Jagat. Put on your trekking boots as today marks the start of our actual trek. After a filling breakfast we get going to Dharapani. The trail starts with a descent towards the Marsyangdi River followed by a walk through a dense forest. We continue on the trail towards Chamje with fantastic views of the Annapurna Range. We cross a suspension bridge after Chamje heading towards Sattale(7 storeyed). The next village enroute is Tal(Lake) where we arrive after a towards the grassy riverbanks of Marsyangdi River. The trail is goes constantly up and down and eventually takes on a steep forested path towards Karte. We pass by few small waterfalls and streams and cross a suspension bridge to get to Dharapani. Overnight at a teahouse in Dharapani. Our destination for the day is Koto. First, we trek towards Bagarchhap, walking through pine and fir forests. While at Bagrachhap, we explore the local monastery. After an hour’s trek we arrive at Danaque followed by a steep climb towards Timang with marvelous views of Mt. Manaslu and Peak 29. Again, the trail passes through pine forest towards Latmarang and along the way we catch a glimpses of Annapurna II. A short walk from Latamarang will take us to Koto. Overnight at a teahouse in Koto. After leaving the village of Koto, we will enter the restricted area, so our permit will be checked. After passing through the check post we continue on our trek to Meta. The path to Meta starts with a trek along the Soti Khola banks which continues through lush pine forest. Along the way we pass by many small streams and have to cross a number of suspension bridges and the village of Dharmasala. As we near Meta, we have to overcome a steep climb through another forest. Magnificent views of the Annapurna II and Lamjung Himal keep us enthralled. Overnight in Meta. Today’s trail starts with a descend to Jhuman followed by a gradual climb towards Khyang. Here we can see the ruins of the Khampa settlements (Khampa are refugees from Tibet) and also spectacular views of Annapurna II, Tilicho Peak, Pisang Peak and Gyaji Kang among others. The path is rocky from here onwards. We cross the Phu Khola to reach Phu Gaon. Overnight in Phu Gaon. Acclimatization plays a key role in a successful trek. Today is set aside to adjust to thinning air at high altitude. Few activities are planned for the day to blend better to the changing condition. Firstly, we go around the village to better understand the culture and the daily lives of the locals. This village is diverse in culture as people of different ethnic groups live here including Gurung, Ghale and Lama. Further, we explore Tashi Lhakhang Monastery, the last monastery built by Karmapa Rinpoche. It is also one of the 108 world’s great Buddhist Monasteries. Besides all the cultural diversities, another attraction of this village is the breathtaking views of the Himlung Himal. Overnight in a teahouse at Phu Gaon. We descend and ascend, pass by many streams and cross a few suspension bridges to finally reach Nar. The day starts with a downhill drop till Mahendra Pul after which we cross a 80 m high suspension bridge over the Lapche River. The trail then climbs up to Nar, passing many stupas and chortens on the way. We can explore many monasteries at Nar and also enjoy the fantastic views of Pisang Peak and other surrounding peaks. Overnight in a teahouse at Nar. This is another acclimatization day to avoid Acute Mountain Sickness when crossing the Kang La Pass at 5,322m the next day. Today, we go on a short hike around the village and also explore the local culture and tradition. However, make sure not to overwork yourself as you’ll need to be fully rested to overcome the high pass tomorrow. Overnight at a teahouse in Nar. Today will be a bit challenging as we cross Kang La Pass at 5,322m. The key to avoid AMS at high altitude is to walk on a slow but steady pace. We start early in the morning with the target of crossing the Kang La Pass before noon to avoid the strong winds which can make it impossible to overcome the pass. From the top of the pass we can enjoy the spectacular views of the Annapurna Massif. We then head down to Ngawal for a good night’s sleep.Overnight in a tea house at Ngawal. Our destination for the day is Manang. Our trail starts with a descent towards Braga village through a pine forest. While at Braga we also visit the monastery there. The trail then climbs up towards Manang accompanied by the views of Annapurna range and Tilicho Peak. Overnight in a teahouse at Manang. We ascend from Manang to a village just above called Tenki and follow an uphill trail out of the Marshyangdi Valley towards the Valley Jarsang Khola. The trail then gradually climbs up through pastures and juniper trees. Enroute to Yak Kharka, we pass a small village of Ghunsa followed by pastures where horses and yak graze. We cross a small river via a wooden bridge to finally arrive at Yak Kharka. Overnight in a teahouse at Yak Kharka. Today, we are headed to Thorong Phedi, the last settlement before crossing the Thorong La Pass. This small settlement is also called the base camp of Thorong La Pass. Today’s trek mostly consist of uphill climb beginning with an ascent towards Ledar Village. We climb further up to reach Thorong Phedi enjoying spectacular views of Mt. Syagang, Mt. Gudang, Mt. Katungkulan and Thorung Peak among others along the way. Overnight in a teahouse at Thorong Phedi. Today we overcome another high pass but it is going to be much more challenging then the previous one. Our target is to cross the pass before 9- 10 am so we can avoid the strong winds at noon which makes it practically impossible to cross the pass. Hence we start our ascent, which will take about 4 hours at 4 am. We don’t spend a lot of time at the top and make a quick descent towards the holy town of Muktinath. Muktinath is a famous pilgrimage site for both Buddhist and Hindus as it consists of many stupas and temples. The 108 watersprouts here and the eternal flame, besides the temple itself, are the main attractions here. Overnight at a guesthouse in Muktinath. Early in the morning we go around and explore the temples and monasteries. Then, we get packing for Jomsom, a town popular for apple and apple products. The trail starts with descent towards the Kali Gandaki Valley following the Kali Gandaki River on a rocky path with many ups and downs. The views of Tukuche, Nilgiri and Dhaulagiri accompany us throughout the day. Once at Jomsom you can try out the famous apple brandy. Overnight at a teahouse in Jomsom. We board an early morning flight to Pokhara. Wereach Pokhara in half an hour at most. After checking into our hotel room, we visit some of the popular places in the City of Lakes including Phewa Lake, Gupteshwor Cave, Davis Fall, and Peace Pagoda among others. Overnight at a hotel in Pokhara. After breakfast in Pokhara, we board a tourist bus that will takes us back to the capital city. It will take around 6 hours to reach Kathmandu via Prithivi Highway. Once in Kathmandu, you can enjoy the last days of the trek roaming around the city, buying some souvenirs or you can just opt to rest in your hotel room. Overnight at a hotel in Kathmandu. Farewell! Today concludes our 19 days Nar Phu Valley Trek. A representative from Adventure Club Trek will drop you off at the airport according to your flight’s schedule. Standard hotel accommodation in Kathmandu and Pokhara; breakfast included. One night accommodation with breakfast at a 3-star category hotel in Pokhara. Best available twin sharing lodge to lodge accommodation while trekking. Full board meals durng the trek (breakfast, lunch and dinner) with tea/coffee. Guided city tour in Kathmandu with world heritage entry permit fees and private vehicle. Experienced, government licensed, English-speaking guide trained in Wilderness First Aid. Staff costs including their Salary, meals, transportation, insurance, domestic airfare and medicines. Lunches and dinners in Kathmandu and Pokhara. Best months are September, October & November during the Autumn season and after mid March, April & May during the spring season are consider as the best seasons for doing this trek. Regarding monsoon season at summer time we do not suggest to try this route from June till August. But at autumn months weather is perfect: there is no rain, and it is warm enough.